The collection of pieces on display reflects the story of three families who succeeded each other at the Bayeux porcelain factory: the Morlent, Gosse and Langlois dynasties. In a space entirely devoted to this distinctive Bayeux craft (1812-1951) you can see how tastes in the decorative arts changed over a period of almost 150 years. The contemporary feel of the exhibition layout underlines the modernity of porcelain made for chemical laboratories, displaying a stock of 3,000 items manufactured at the end of the Second World War. A paste consisting of pure kaolin, different sands and chalk is prepared and then shaped either using a wheel or by being poured into a plaster mould, although this technique was only developed in Bayeux from 1898. The pieces are dried before their first, biscuit firing at 800°C. The porcelain is then glazed to achieve its characteristic sheen. Some decorations are painted on to the piece with a brush after biscuit firing and before glazing. In Bayeux only cobalt blue and chrome green are used for this. A second firing takes place at 1410°C which serves to vitrify paste and glaze. The other colours are only laid on the glaze after this second firing. On 9 June 1812, Pierre Joachim Langlois and his wife acquired the buildings of the former Benedictine convent in Bayeux, which had been confiscated during the Revolution. This marked the beginning of the Bayeux porcelain factory. The earliest pieces to be known as “Bayeux” have patterns laid on the glaze with contrasts in mat and shiny gold, sometimes enriched by multi-coloured little flowers in 18th century style. 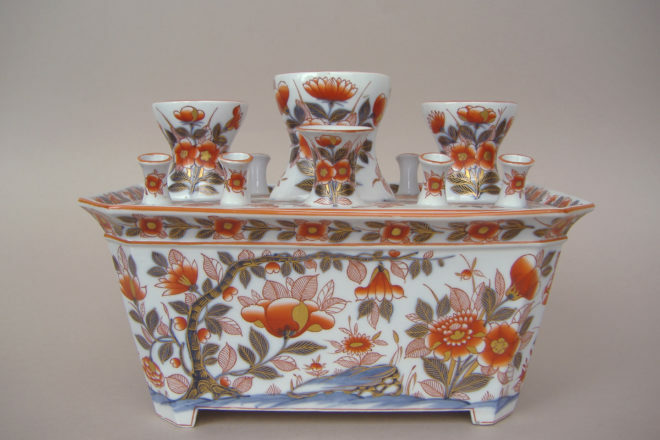 The most famous porcelain objects of the Langlois period have blue, red and gold motifs, inspired by Far Eastern porcelain. On 10 October 1849, when the factory was sold at auction, François Gosse was the sole bidder. 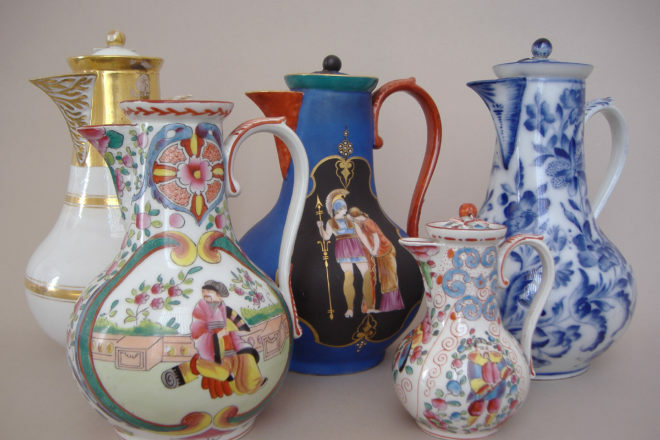 Bayeux porcelain from the period 1855-1879 can be identified by the signatures “GOSSE/Bayeux”, “G/Bayeux” and “Bayeux”. The decoration evolved from oriental influences towards the prevailing use of a vegetal motif inspired by apple blossom. This was highly successful and became the main style of decoration from 1870 onwards, under the direction of Paul Gosse. A remarkable item in the MAHB porcelain collection is the “Pyrogenic” match striker, for which the Morlent brothers obtained a patent and which was very successful. It could be adapted and customised with the names of brands of drinks or hotels and restaurants. When J. Morlent acquired the factory on 9 September 1878, it entered its industrial era. 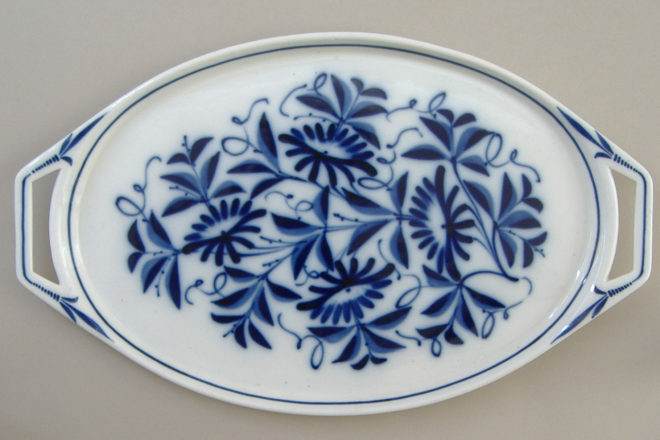 “Saxe” and “cornflower” decoration, still carried out by hand with a brush, were added to the “apple blossom” motif. Finally, J. Morlent designed the “daisy” motif, specific to Bayeux porcelain. During the Second World War production was completely disrupted. After the Liberation, in spite of major investments being made, the factory went out of business in 1951.